Weeks with the temperatures below zero. Snow, snow, and more snow. It was a particularly brutal winter two years ago that convinced Jim, 67, and Barb Kohlmetz, 62, that it was time for a change after living in Wisconsin all their lives. Now they jet down to Costa Rica after the Christmas holidays and stay in their home in a quiet beach community on the central Pacific coast until after the spring thaw. As retirees—they were in education for a combined 73 years—they have the flexible schedule perfect for part-time residents. Because of Barb’s aging parents and ties with family and friends, the couple doesn’t plan to move down to Costa Rica permanently. “I think we’ll do five months out of the year total in Costa Rica,” says Jim. The first time the Kohlmetzs visited Costa Rica was a brief stop on a cruise. They took a rain forest tour on the Caribbean coast and fell in love with the country. So they started researching. “We came to the central Pacific, and really liked the area. It’s beautiful,” says Jim. 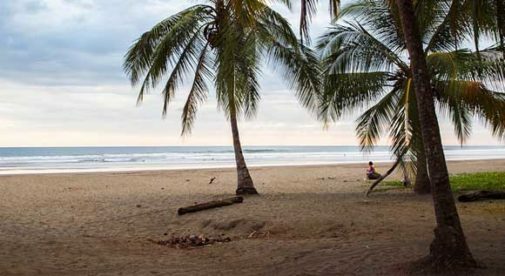 They settled on Playa Bejuco because it is quiet, mostly residential, and within walking distance of a palm tree-lined beach. “There are a lot of beautiful beaches in Costa Rica. But I was really impressed by Bejuco,” says Jim. It’s not a major tourist destination, and there’s not much development. Most days there are few people around. Their house is in a gated community of about 100 homes. It came with a tropically landscaped garden and fully-furnished, ready to move in, for under $200,000. It’s a property they couldn’t have afforded in the U.S. More importantly they felt comfortable there from day one. There are frequent parties and get-togethers, including during holidays. “We have no family here, so we all have to be family to each other,” explains Barb, who adds that they’re also active in the English-speaking church in the larger town of Jaco, a popular expat spot, 20 minutes’ drive to the north. In general, says Jim, everybody in their community is quick to lend a hand or do a favor when you need something. Several neighbors, including Jim and Barb, are planning a trip soon to visit the Boruca indigenous community in the southern part of Costa Rica. The couple has also done a lot of travel on their own, especially when friends and family visit. They’ve been to the Lake Arenal—the hot springs and hiking are a big attraction, as well as charming towns like Grecia and Sarchi in the Central Valley. The lush rain forests of Manuel Antonio just down the coast are a great place to hike and see wildlife. “We’re exploring the country. There are so many things to see,” says Barb. The couple has learned to settle into the rhythms of life in the tropics. The coastal areas of Costa Rica can be hot and humid. But the couple is adapting. Barb says they use fans during the day and air conditioning only at night for comfortable sleeping. “I love the sunshine. And if we get too hot, we can jump in the pool. The sea breeze in the back helps,” says Jim. They’re learning Spanish, too. Barb says they can communicate with most people they come across, but there is sometimes a language barrier. Their English-Spanish dictionary is always at hand. When Barb recently fell and had to get an X-ray at a local clinic (for which she paid just $20), they found that many of the doctors were fluent in English. And she received great care. They’ve also learned a new way to shop. A fishmonger delivers fresh-caught fish, lobster, and shrimp every Thursday. Jim says they get huge lobster tails for $15 that would cost $40 to $50 in the U.S. And they also enjoy Friday trips to the feria, or outdoor farmers’ market, in Jaco. “We eat a lot of fruit. So it’s nice to get fresh pineapple and melon and fresh vegetables too,” says Barb, who adds it’s very affordable. All in all, they’re relishing their time in Costa Rica. “It’s a wonderful change. This is the biggest move I’ve ever made,” says Jim. “It’s an adventure. We have lots of new experiences, and that keeps the mind sharp,” adds Barb.